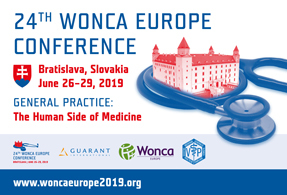 On behalf of the Slovak Society of General Practice it´s my honour and pleasure to invite you to the 24th WONCA Europe Conference, which will be held on the 26-29th June 2019 in Bratislava. In these times of intense scientific research and technological changes, the human side of medicine is becoming more and more important. Therefore the main theme of our conference became “General practice - the Human Side of Medicine“. We believe that family doctors have to work on human and personal lifelong relations with their patients. More open relationship helps family doctors to increase the quality of prevention and care. To take care of our patients is more than just to diagnose them and to treat them. It also means tailoring the diagnostic process and treatment to the needs of our patients, avoiding overdiagnosing and overtreatment. Health and happiness can´t be experienced individually, alone, but in a healthy and happy human society only. The Scientific Committee has been preparing an exciting programme based on original abstracts and contributions from leading international scientific networks and special interest groups recognised by WONCA. We also offer interactive discussions between Slovak patient’s organisations and WONCA conference participants. Slovakia is known as the heart of Europe and Bratislava is the capital. It´s a small, safe and cosy city with a conference venue located right in the centre. The conference venue is situated between the historical city centre and the river Danube (in many countries known as river Donau). The conference venue consists of 3 buildings around one square - Slovak National Theatre, Sheraton hotel and Cinema City - everything within short walking distance (2 minutes as a maximum). We´re connecting education, history, nature and entertainment together at one place. Bratislava is ready to host the conference and we are looking forward to see you on the 26-29th June 2019. Save this date into your calendar for WONCA Bratislava.